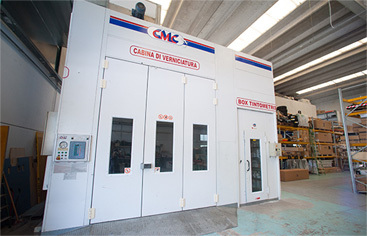 Since 1984 we take care of arranging special vehicles. We are known to be able to answer many specific demands, by providing highly personalized solutions. Today our complex in Val Fontanabuona, Coreglia Ligure, is made of more 1500 m2 internal space, with an external courtyard dedicated to second hand vehicles of more than 1000 m2. As an affirmed reality in Liguria, we are now facing to integrate ourselves in the national market, by offering our products with a high degree of customization. In July 2014, with the entrance in EMAC, provider of biomedical machinery and medical devices, we made one more step in the continual growth which distinguishes our career. Our care and eye-for-detail is enriched by joining a company structure business and commerce oriented and able to compete in a highly selective market. Indeed client satisfaction means not only to execute properly your task, but also to answer every single demand. Furthermore it also means to have all the necessary knowledge of technical and technological issues, and company organization, so to manage properly every single stage of the production process. To deliver high quality products every worker needs to be able to fully concentrate on his specific task, in the confidence that all other tasks will be managed with maximum care. Our company is structured as a network of independent units working together as a team. This is our main asset and added value in a highly competitive market in which evolution is vital. Carpentry is the early stage of the production process. 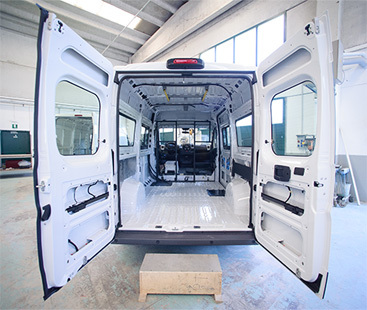 In this stage the transformation of the vehicle is staged, the supporting structures and the safety cell are built, thanks to the experience from our long standing tradition. Our technicians are trained directly here at AVS in a long trainee-ship, during which they acquire theoretical and practical knowledge of basic materials – iron, steel and aluminum – machinery to work them with – cutting, drilling, boring, bending, welding and smoothing. In our workshop supports, bases and bracings are built, on which will be anchored all the later parts that will constitute the final vehicle. Raw and noble materials are worked, such as metal bars and sheets, using both traditional and technologically advanced techniques. The results makes for an absolutely solid and trustworthy structure. Finishings will therefore be specifically integrated to the basic vehicle picked by the client. Sheet metal working is the middle stage of the construction of the emergency equipment compartment. Depending on the specific requests from the client the setting up is made by hand and customized on the individual vehicle. 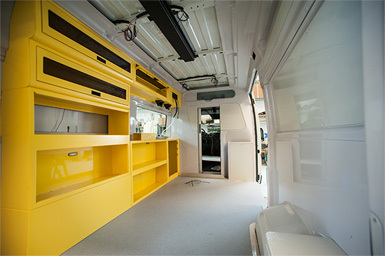 Every set up is made in accordance with safety laws and regulations and it makes the emergency compartment reliable and comfortable for both workers and patients. This stage includes protective measures and finishings on the elaborated parts. By employing organic and quality materials the vehicle gains endurance and strength against decay. Each project can be visually customized, with the possibility of creating, printing and applying different designs. Bodywork is one more pride for our company. We can apply any kind of work, from reparations to painting, from maintenance to safety checks. Restoration and inspections of chairs, stretchers and all medical equipment. Inspection checks for steps and electro-hydraulic shifters for the disabled. Inspections for O2 supply systems. On place replacement for flashing lights, strobes, LEDs, bars and sirens, installation of 10g locks for chairs and stretchers, and all the small acts of maintenance that can be operated outside our operative workshop. AVS has dedicated a show room for our products and all emergency vehicle equipments. of each product and make the most of their choice.